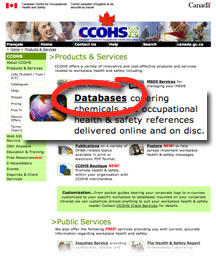 It is now faster and easier than ever before to order CCOHS Products & Services online using our new and improved e-commerce system. Buy a health & safety pocket guide in print or electronic format. anywhere you have access to the Internet. Choose a product or service that suits your need(s). Click on the Products & Services tab in the main navigation bar from any page on our website. 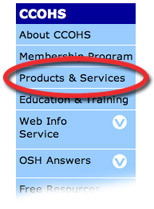 use our handy Products & Services Listings pages to locate a product or service alphabetically, by subject or by type. From the Category Listing page click on the product name or the BUY ONLINE button to go to the product page. On the product page read the detailed product description and follow links to other relevant information. In the Place Your Order box use the drop lists to select available options for the product. The price shown in the green box is dynamic and reflects the options chosen as well as quantity discounts, mult-user discounts, etc. Add the item to your shopping cart to begin the simple, secure Check Out process. 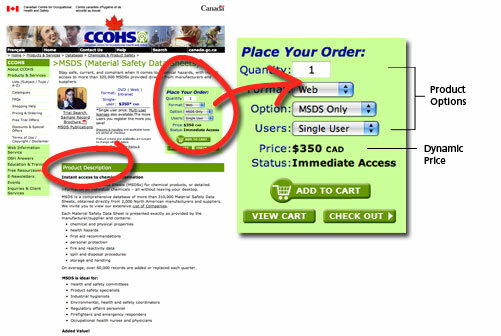 If you choose not to create an account you can still proceed through the checkout using a Visitor Cart. Use the progress bar (illustrated here) to monitor your progress through the Check Out area. It can also be used as a navigation tool as well as a visual aid. Remember to download from the invoice page any PDF publication(s) that you may have purchased.